Trabolee’s recent upward trajectory in his career started off with the release of his THC mixtape in 2013, his setting up a partnership with Juke Myster to release Occult Lore as SkullVilla and featuring in The NEST’s stellar Our Guns Don’t Work in 2014. These bodies of work promptly set him apart as one of the bankable emerging hip hop acts. His penchant for exploring unconventional themes with a heavily loaded lyrical delivery teetering between rap and spoken word has made him a popular headliner of The Pit sessions. 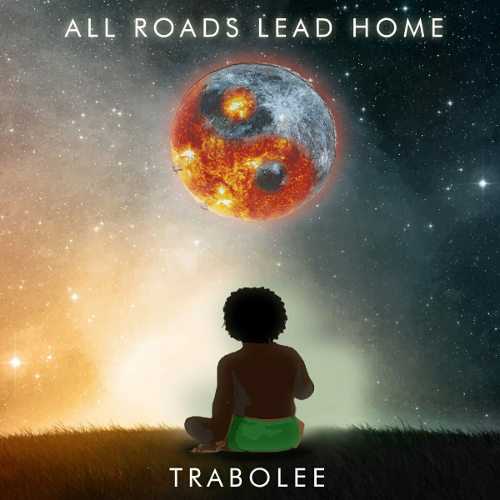 Trabolee gets even more contemplative in his debut album entitled All Roads Lead Home, released on 21 February 2015. All Roads Lead Home is an extensive exercise in existential curiosity. In between the meticulously crafted lyrics, Trabolee asks profound questions about the relation of the human being to the rest of the universe. In I Forgave You he ponders about death and letting go of the past from the very personal perspective of a son laying to rest an absentee father. There is an interesting contrast between mental enslavement and mental elevation in Trapped and Die For Your Answers. He perceives his moments behind the mic as intense, spiritual, out-of-the-body experiences in Towards The Sublime, Scratching The Surface, Ego Death, RAWTRABO Reprise, Play Em Loud and Frank. When he descends much more closer to Earth, Trabolee explores less difficult themes such as romance (Beauty of Life), the sad state of politricks (Still A Slave) or having confidence in oneself (Lush). Either way, there is hardly a dull moment lyrically throughout this album. There is no limit to the subjects and objects Trabolee utilizes to get to a successful punchline. Much of the album’s enjoyment is derived from this relentless quest for well-rounded bars full of rhythm and clever metaphors. His featured guests also bring their A game to their verses, especially Qina and Genetic Disorder. On the production side of things, Trabolee sticks to his go-to producer Buff Beats for most of the tracks, with Playmkr and Edd Da Beatsmith contributing a solitary track each. Buff generally has a generally good understanding of the direction to take with Trabolee’s lyrics, getting to his peak on Frank, I Forgave You, RAWTRABO Reprise and Towards The Sublime. He also drops a bunch of sweet samples as diverse as the lyrical content – an Alan Watts lecture, a Jill Scott- Sergio Mendes collaboration, even a Jay Z television ad announcing Magna Carta Holy Grail. All Roads Lead Home is probably the most lyrically potent Kenyan album out this year. Despite the fact that the themes and quite a good portion of the lyrics may be a bit difficult for the average listener to grasp in a single listen, there’s something in there for everyone who loves hip hop. It’s an album you can listen to for the fifth or sixth time and find something new to smile about. Contact Trabolee on Twitter or Facebook to cop the album.